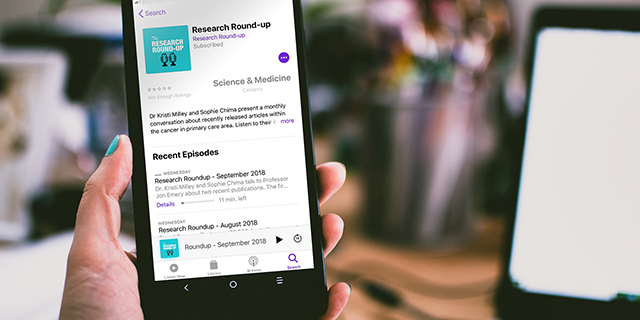 Dr Kristi Milley and Ms Sophie Chima present a brand new monthly conversational podcast about recently published articles within the cancer in primary care area. The articles discussed look at the role of GPs and nurses and cover the cancer journey from early prevention, detection and diagnosis through to cancer screening, survivorship and palliative care. The podcast is produced by the Primary Care Collaborative Cancer Clinical Trials Group (PC4). Research Round-up provides a fascinating insight into current and historical contexts of cancer in primary care literature with PC4's leadership team. Listen to their informal interviews with the authors and their general discourse on articles released within the month. Subscribe today and please leave a review.